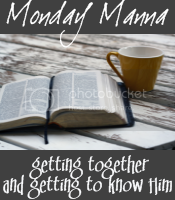 The purpose of Monday Manna is to get together and get to know Christ more through His Word. On the first and third Mondays of each month, anyone who wants to participate can post their thoughts on a specific verse--posted here at my blog on the Thursday before, to allow you to chew on it over the weekend. It doesn't have to be long -- just a few thoughts, a picture you feel helps express it, a poem, a short story, a devotional. Just post it on your blog on Mondayish (early OR late is fine, by the way! ), then come back here and link up in the MckLinky gadget that will be at the bottom of MY post at o'dark thirty that morning. I've got a lot of change going on in my life right now. School starting for the kids. Getting a new car (after totalling my old one!). Looking into moving to a smaller house. And those are just the big ones. So I think it would behoove me (and perhaps you) to contemplate that which does NOT change. Hope this verse motivates you - and that you'll put something together and link up here on Monday or Tuesday. See you then! Good choice, Joanne! My 3rd grader and I were just going over his Bible homework in preparation for a test tomorrow. It was all about God and his commands, backed up by promises. I might have to ponder this one a bit more and chime in on Monday/Tuesday. Lots of love, friend. What a great verse, Joanne! The promises written here are repeated throughout the Bible, and are truths we must not forget.